"Good afternoon, ladies and gentlemen, and welcome to MegaMerged Airlines Flight 0 to Nowhere. 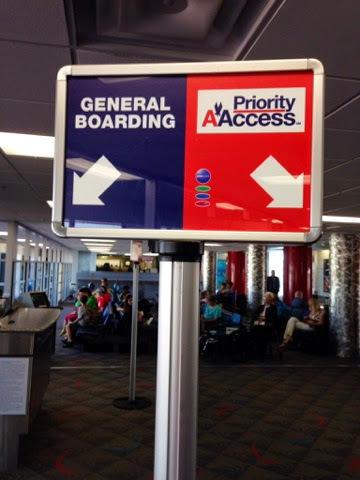 We'd like to begin boarding with our First Class passengers through the Priority Portal on the left. We'd also at this time like to welcome our Gold, Silver, Platinum, Diamond, Emerald, and Ruby passengers, as well as our Aardvark Skymiler OncePass Primere passengers, our Aadmirals SkyeClube Ultra Premium Elite passengers, and the holders of our Super Aadvantageous UberFabulous Golden Platinum Aall-Aaccess Visa card, all please board via the Priority Portal. If we have any pre-board passengers, they may also board at this time." (Now that 3/4 of the plane is boarded) "Boarding Group One, please board at the STANDARD (sneers) Portal (to the right of, and identical to, the Priority Portal). This is better than "Group A, Group B, and Group C" in what way exactly?? ?